It's been just under a month since KneadWhine celebrated its first birthday and this is the final guest post to celebrate that. I've got a few posts and recipes of my own that are very nearly ready to share and I'm looking forward to taking over the reins again now that I have a bit more time to cook. Penny is a really good friend of mine. She's one of those mum friends that has been around since D was tiny, with her daughter C. C and D have grown up together, been to Tumble Tots together and it's been amazing to see them change from tiny babies who didn't interact to preschoolers who can have whole complicated conversations and games together. It's also been lovely spending many an evening over a meal setting the world to rights with Penny and other mum friends. Mum friends are great, aren't they? Happy 4th July! Since I love all things Tex-Mex this seemed the perfect day to roll out one of my favourite comfort food combos of all time. 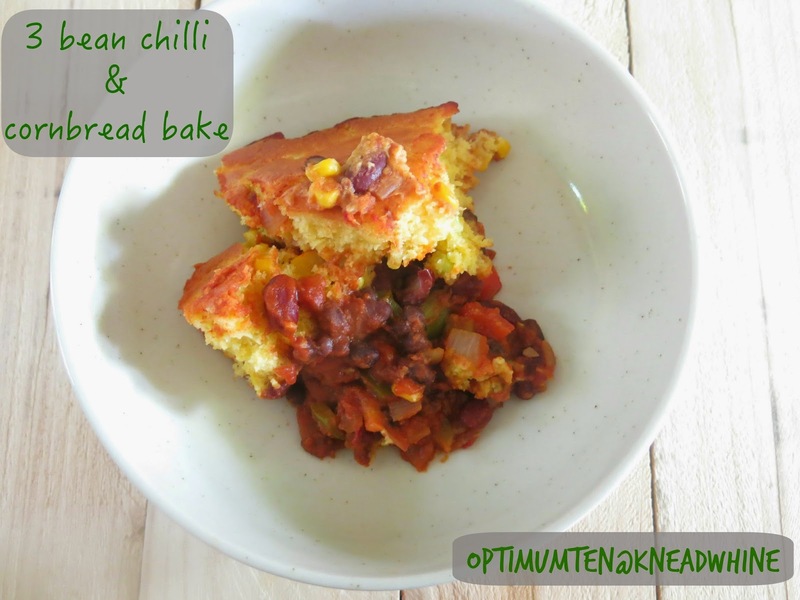 Chilli and cornbread. In this one pot meal the chilli is first prepared in an oven-proof casserole dish, and the cornbread added to the top before baking in the oven. A lovely start to any weekend. Serve with any of your favourite Tex-Mex accompaniments, such as fresh salsa or guacamole to up the vegetable count, or just a dollop of sour cream or low fat Greek yogurt. 1. Preheat the oven to 190oC fan-assisted. 2. Melt the butter for the cornbread in your oven-proof pan and then pour this into a separate bowl or jug. 3. Add the milk and eggs, whisk thoroughly, and place to one side. 4. Now add the olive oil to the pan and gently fry the diced onion, peppers and garlic for 5-10 minutes over a low heat until soft and golden. 5. Add the ground cumin and paprika and cook for another minute. 6. Add the beer or stock, turn up the heat to medium/high and stir well. 7. Add the crushed tomatoes, and all three cans of beans and mix. 8. Season with salt and pepper and simmer over a low heat for 10 minutes. 9. In the meantime, make the cornbread by combining the cornmeal, flour, baking powder, salt and sugar in a bowl. 10. Add the egg, milk and melted butter mixture from earlier and mix well. 11. Stir in the drained sweetcorn and chillies or spring onion if using. 12. When the chilli is ready, check the seasoning and spiciness. Add hot sauce to taste. 13. Remove the chilli from the heat and spoon over the cornbread batter. 14. Bake in the preheated oven for 35-40 minutes, checking about half way. Loosely cover with foil if the top is getting too brown too quickly. Bake until the cornbread is golden and an inserted skewer into the middle of the bread comes out cleanly. Want to see the rest of my guest posts? Here's Kate's dips recipes, Swazi's review of Smollensky's and Coombe Lodge, JustJanis's review of Roseleaf's Madhatter's Tea Party and Abby's review of her favourite cookbook.